Posted on April 1, 2019 at 2:32 pm. Safe Routes to School is a movement aimed at making it both safer and easier for students to walk and bike to and from school. There are Safe Routes to School (SRTS) programs across the United States and Canada with a variety of initiatives that are often specific to the county, city, school district, or even to an individual school. These initiatives often involve sidewalk and curb extension improvements; school zone signs and beacons; crosswalk upgrades and/or crossing guards; radar speed signs and other speed enforcement; and more. Today, these programs are more important than ever: walking to school is not as prevalent as it once was—schools may be farther away, family structure and routine may make walking a challenge, and the area may lack infrastructure that both supports and encourages active transportation. Studies have shown that two-thirds of drivers exceed the posted speed limit in the 30-minute period before and after school, when school zone speeds are in effect; other studies show that about 21,000 children are injured in school zones each year. With statistics like those in mind, many municipalities are working to make a difference by directing funding towards SRTS and similar programs. 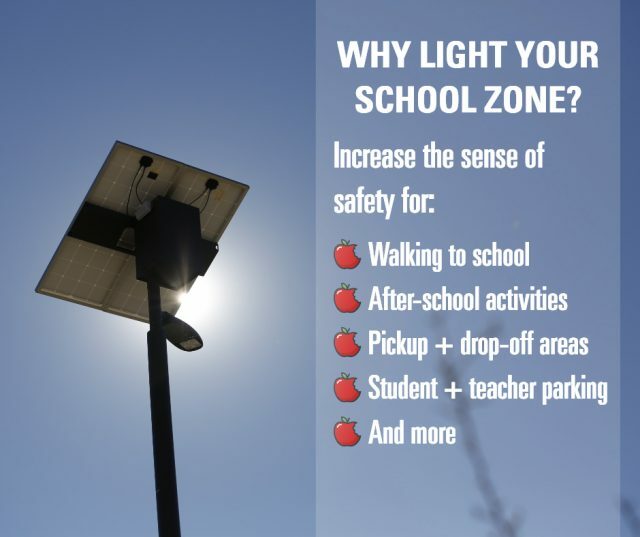 For the most part, children are walking to and from school during daylight hours, but that doesn’t mean that lighting should be left out of your SRTS initiative. In the middle of winter, children may have to walk to school in the dark, and likewise, many after-school programs including sports, concerts, and other events can occur after sundown—think Christmas concerts or basketball tournaments. Ensuring functional, reliable lighting is available outside your school and throughout the school zone can make a big difference to the sense of safety and the level of visibility in pickup/dropoff areas, among other benefits. Your SRTS team may include representatives from the local government, police, school, and PTA, as well as county and state representatives and other interested parties. Get everyone to identify the goals of your upgrades, which could include sidewalk replacements, bike lanes, crossing guard training programs, pedestrian safety skill education in the classroom, or increasing enforcement in school zones, among many other priorities. Your group may choose to add street lighting or area lighting if one of the top concerns is poor pedestrian visibility. Proper lighting is essential at intersections, and it can also be valuable at mid-block crosswalks, along pedestrian pathways that students frequently use to get to school, and in school parking lots or other school property frequented at night. Lighting also increases the perception of safety for students and others walking through the area in the evening hours. Lighting placement: Lights should only light what’s needed, be spaced for adequate coverage, and be appropriately scaled for their use. That means lights should be focused on the sidewalk, crosswalk, or intersection where they are intended, and not into people’s yards or into the night sky (learn about dark-sky friendly lighting here). Lighting type: Wired lighting may be most practical at intersections if there is already existing wiring in place to utilize; this option will require little maintenance over time. Meanwhile, choosing solar lighting can be more practical for mid-block locations where a grid connection is not usually available without trenching the sidewalk and other existing infrastructure to add wires. This can be a prohibitively expensive cost that is avoided altogether by choosing solar lighting powered through batteries. Costs for solar lighting are dropping, making it a more cost competitive option than ever before, and when the light is correctly configured for the location, it can provide reliable, long-lasting lighting that requires little maintenance and no electrical bills. Installation and maintenance: Choose lights that will be cost-effective to install and maintain. Try running a cost comparison to get a rough idea of solar versus electrical lighting costs for your location. Utility service agreements will also be a factor for both installation and maintenance. Maintenance can be straightforward for electrical lighting, but if a bulb goes out, it could cause many bulbs to go out. Solar-powered lights will avoid this problem; however, it is important to ensure the lights were configured properly for your location or you may end up with dead batteries or with dim lights. Funding: When lighting a school zone, SRTS funding can help cover costs. SRTS funding is part of the Transportation Alternatives Program (TAP), a federal program that covers a wide range of projects related to active transportation. Read our article on trail funding to learn more about TAP and other funding options that could also work for your school zone lighting. Ready to explore solar lighting as an option for your mid-block crosswalk lighting, parking lot lighting, or street and pathway lighting? Try our Build, Price, and Compare tools to see the long-term cost benefits of choosing solar-powered solutions.